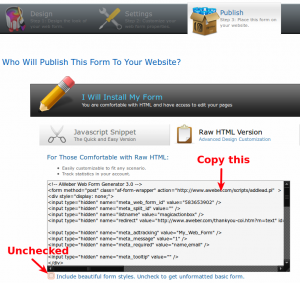 This guide will walk you through setting up an action box using the html code from your email opt-in provider i.e. 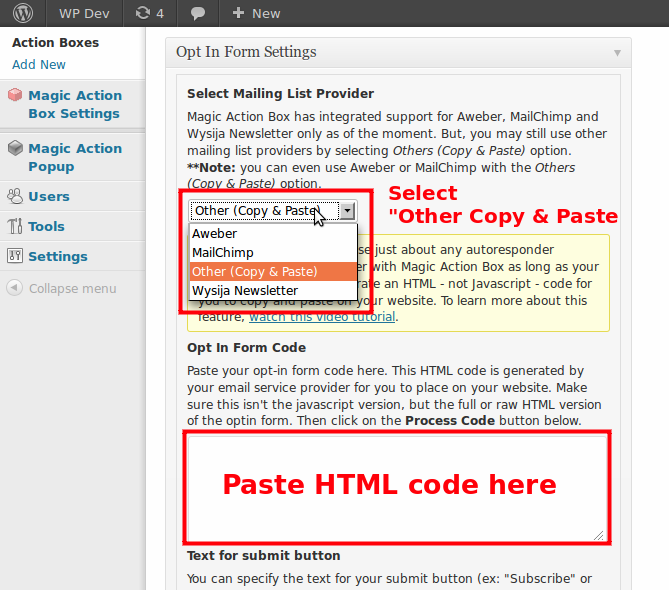 MailChimp, Aweber… This guide should work with any provider as long as they provide a html code for you to copy and paste to your website. 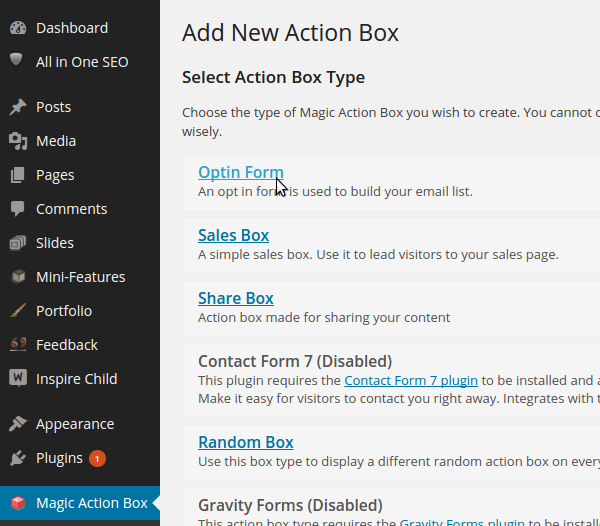 Magic Action Box also has built-in integration with some of the most popular email list services and form plugins. If you want to use Magic Action Box with built-in integration, follow this guide. 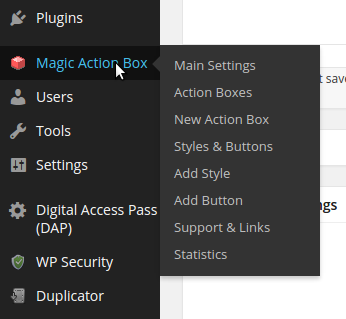 After installing Magic Action Box (or MAB for short), you should see two new menu items in your WordPress Dashboard – Magic Action Box. So, what we’re going to do is to add an opt-in box at the bottom of your blog post. If you’re wondering why the bottom of your blog post is the best place to put your opt-in box, check out this article for the reasons why. There are different types of action boxes and you cannot change the type of an action box once you have chosen it’s type. In the next screen, set name for your action box. Right below that, you’ll see the Action Box: General Settings section. Skip that for now and look for the Select Mailing List Provider dropdown in the next section. Choose Other (Copy & Paste). 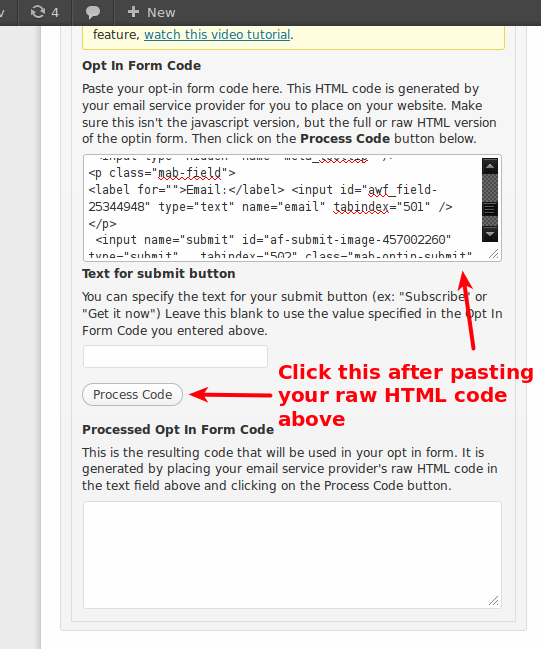 Now paste the raw HTML form code that you copied from your email list service provider in Step #1 into the Opt In Form Code field. Then click on the Process Code button. We do this because each email list provider has their own way of setting up their opt in form code. But MAB cannot create a style for each email list provider. So, what we do instead is to process the opt-in form code from your email list provider and mold it into something that MAB can style and use. Tip: If you want to change the submit button text, do this before clicking on the Process Code button. And yes, you can process the code any time. Next, style your action box. 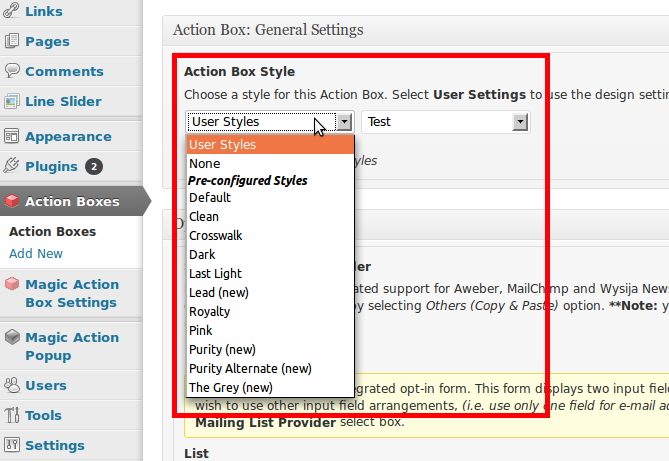 Go back up and look for the Action Box Style drop down select box and choose a style. And add in the headings and other text you want the action box to have. You can also show an image to go along with your action box. Now save your action box by hitting the Publish button. 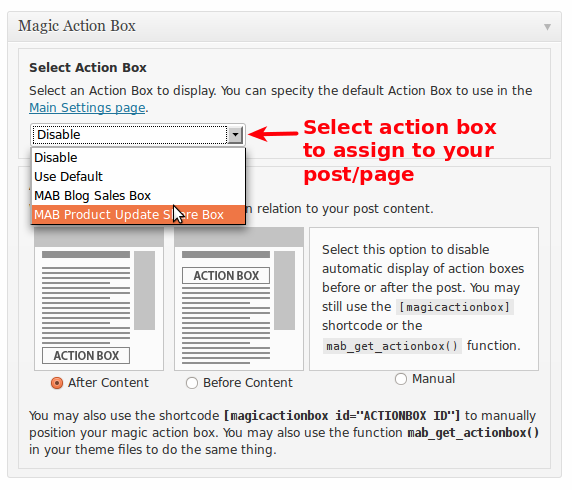 Head on over to the blog post (or page) where you want the opt in box (action box) to appear. Edit the post/page and look for the Select Action Box dropdown. 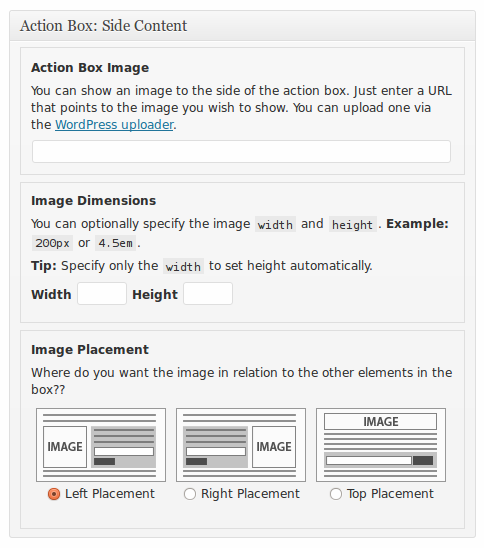 Select the action box that you created in steps 2 and 3. 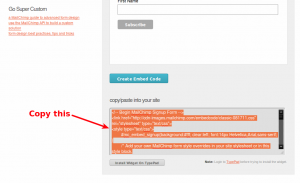 You can also choose to show the opt in box before the blog post or after it. That’s it. View your blog post and you should see the action box show up below the content (if you chose the After Content option). If you are getting problems, go to our support site at http://prosulum.zendesk.com and create a ticket. We’ll get in touch within 24 hours. Tried it. Read the instructions. Pushed the Edit and Wallaalaaaaa……………..NOTHING!….didn’t work. Sorry. Use our support email support@prosulum.zendesk.com and send us the HTML code you used. I have installed yesterday the plugin and I am not satisfied! When I name the Titel I cannot safe – it comes instead the questions “leave the page” or “stay on this page”!! Safing is only possible by deleting the Title completely! I have try it more times! How I can see BOX I ahve created??? in Preview I cannot see anything! This is not support. Send us an email at support@prosulum.zendesk.com. I had the same problem and was very frustrated and finally gave up. Then I discovered that my changes were saved. SInce that time I just ignore the leave the page without saving warning and click leave and it just saves it and keeps me on the page. that make putting the magic box at the end of the post difficult.. I would like to see a shortcode added to make this easier when hitting conflicting plugins…. There is a shortcode with pro. There is also an option to make MAB show first. I have a problem: The bottom style that I designed, doesn´t appear in the box. I also configured the style of the box (head center, font style, etc.) and doesn´t show up. Any idea how can I display a random Magic box ( I have 6 of them so far) under each post? I saw that feature in the change log, but couldn’t find it in the plugin’s settings. In the pro version, where you would normally pick a new action box type there is a “random box” type. It will walk you through the process of creating a random box using all of the different ones you’ve made. Hi — I’m interested in an opt-in form on my home page, right at the top, below the header. Does Magic Box accommodate such placement? If so, how does one accomplish that? Thanks!